"Democrats", "Jobs", "Republican governance", "Republicans", "economic direction"
In the fledgling economy, Friday's jobs data showed some signs of new life. Private sector employers added 67,000 jobs in August, better than expected, while the private sector data for the rest of this summer was revised up (see chart on right, credit: New York Times). Overall, however, public sector job losses -- mostly the loss of temporary census jobs, but also about 6,000 other public sectors jobs were lost -- doubled up for a net loss of 54,000 jobs, ticking the unemployment rate up to 9.6%. There are other signs of life in the economy, too. Prices for single family homes have stabilized, business capital spending (on equipment and software) is up an impressive 22%, and manufacturing is gaining for the first time in a long time. Half of the Federal Reserve's 12 districts have noted signs that the economy is starting to rebound. The Rockefeller Foundation finds that state tax revenues are up by 1.4%, compared to a devastating decline of 17% last year (hat tip to Daily Kos commenter "Beet"). As the economy struggles to gain back some footing, Republicans are going for a full court press to try to keep it from making a comeback. The GOP leadership in the House and the Senate were hoping for far worse jobs numbers in the public sector, as they blocked and delayed the passage of a $26 billion state aid bill that is expected to save up to 300,000 jobs. Already, states and local governments have shed 170,000 jobs this year. State and local governments shed 48,000 jobs last month, bringing this year’s losses to about 170,000, according to the Labor Department. The bill would provide $16 billion to help cover states’ Medicaid bills plus $10 billion for teachers. So what's the Republicans' beef with this bill? You see, the bill was partly paid for by eliminating tax breaks on corporations that offshore American jobs to other countries in the search of slave cheap labor. The bill would be financed in part by a $10 billion tax increase on multinational corporations, which split lawmakers along party lines. Democrats said they are cracking down on the abuse of foreign tax credits intended to ensure companies aren’t taxed by both the U.S. Treasury and foreign governments on earnings abroad. Republicans, along with trade groups such as the U.S. Chamber of Commerce and the Business Roundtable, called the tax increase a jobs killer. Since when is not giving tax advantages to American multinational corporations to create jobs in China a "jobs killer?" Unless of course, your intention is to create jobs in China rather than in the United States. I hope the Republicans take this message to voters in November, and I hope Democrats remind voters just what is at stake. The modern GOP simply can't stand Americans. The GOP is not just hostile to public sector jobs -- which, apparently they do not believe are real jobs. The GOP is just as hostile to job creation in the private sector. They have consistently blocked clean energy legislation that is expected to add jobs. The Republicans in the Senate are still blocking a small business jobs bill that, if passed, would create hundreds of thousands of jobs. As the Senate Republicans all voted to block the bill from even coming up for an up or down vote, they came up with an excuse even more novel than "big corporations would have to stop being coddled" -- the argument this time is that not enough GOP amendments were allowed (although each side would get votes on three amendments). Just what is wrong with an up-or-down vote on a bill to help community banks help businesses in their community, Leader McConnell? For the past few months, the GOP has been arguing that the jobs numbers are grim because of the policy uncertainty caused by Barack Obama's radical legislative agenda. So, do today's numbers provide support for that? Well, no. 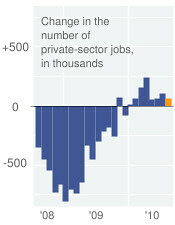 The private sector added almost 70,000 jobs. Now, it's possible that they would have added more new jobs in the absence of the Obama agenda. But then you look at where the jobs came from: The largest gains were in the health-care sector, where 28,000 jobs came online. Health-care reform doesn't appear to be scaring that industry out of hiring, which is as you'd expect, as the bill makes demand for the services more, rather than less, likely. Monday (September 6) evening in Milwaukee, WI, President Obama is going to lay out a $50 billion plan to invest in rebuilding and strengthening our nation's infrastructure. I am quite certain the Republicans will find a way to oppose shoring up America's infrastructure as well. There is an impediment to job creation in this country that is man-made. Insofar as the impediment to job creation is a result of policy, it is a result of conservative policies, not progressive ones. Republicans have consistently opposed aid to states, aid to the unemployed, and even aid to their own favorite talking point: small business. The professional poutrage manufacturers on the political right would like to assume the mantle of fiscal responsibility after causing the economic meltdown. They want to do so by stopping all help to ordinary Americans and small business, and delivering the money to the ultra rich.